We’ve been contacted by the producers of ‘Healing Voices‘, a documentary that explores experiences commonly labelled as ‘psychosis’ and ‘mental illness’ through the real-life stories of individuals working to overcome extreme mental states and integrate these experiences into their lives in meaningful ways. If you, or your organisation, is interested – you can see their different screening packages. These packages include the one-time right to screen the film publicly, publicity materials, screening guide, and DVD/Blu-Ray to keep for home use. They also welcome people using the screening to raise money for their group or organisation by selling tickets and/or asking for donations on the night. 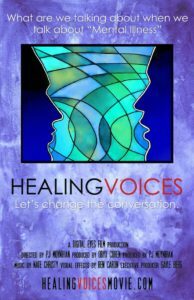 Healing Voices is an independent initiative and is not part of Intervoice, so if you would like to talk about screenings or the film itself please contact them directly at http://healingvoicesmovie.com/connect/.